Gema Ramírez inspires people to raise in consciousness through Coaching, Healing and Mentoring. She guides people to waking up to higher levels of Joy, to Live from the Heart, to Allow Wellbeing, Happiness and Abundance in their lives, to Love themselves and to Lead Consciously with Peace. She is a Transpersonal Life and Business Coach, accompanying people and organisations to lead a more fulfilling life. With over 20 years of working in the corporate world, working with some of the largest IT multinationals, she has a solid and proven background in IT Training, Change Management, Coaching and Leadership. Her passion about her own self-development and spirituality has driven her life. She is a Reiki Master and has studied many other healing modalities. She now integrates her passions to work in what brings her Joy: using her wisdom, her open heart, her experience and knowledge to raise awareness and empower people to life better lives. 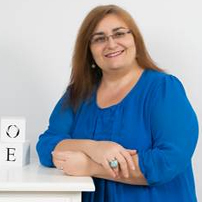 She is the owner and founder of gemaramirez.com and Sweet Blue Global (sweetblue.global). She is also the chairman of Shambhala Trust, an educational Trust based in Glastonbury, UK and is the director of AlientaCoaching, bringing the successful Coaching Expert Spanish course to the UK in the Spring of 2017. Gema will be releasing her fist co-authoring book in February 2017.